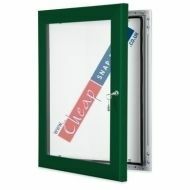 Moss Green (RAL 6005) Poster frames that are lockable and waterproof. 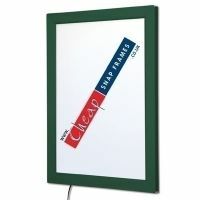 This moss green lockable poster frame can be displayed portrait or landscape, and door stays keep the door open whilst your posters are changed. This is a high specification poster display frame and a deep green popular external poster frame. Available in 8 standard stock sizes from A4 to the huge 40"x60" with bespoke sizes also available. Delivery is only £10 + VAT for UK mainland including London delivery.